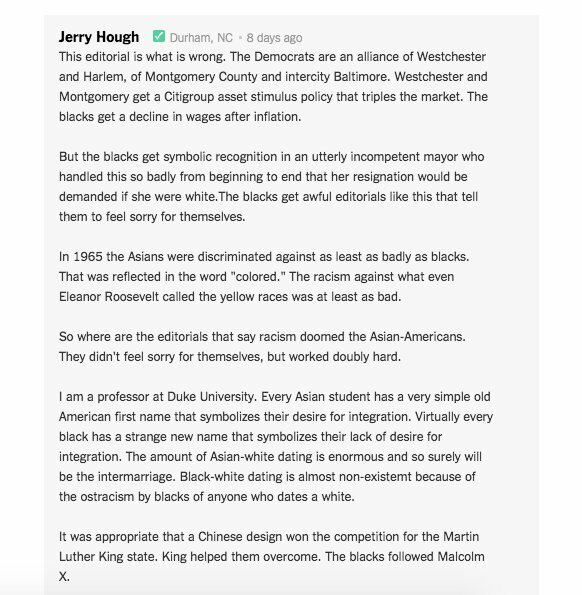 Jerry Hough has seen a lot in his 40 years as a professor at Duke University -- including that “the blacks” in his classes just don’t have the same desire to integrate into American society as “the Asians” do. Hough's comment was met with harsh criticism from social media users, students and school officials. "The comments that were posted on the NY Times website were noxious, offensive and have no place in civil discourse," Michael Schoenfeld, vice president for public affairs and government relations at Duke, told The Huffington Post in an email. "Duke University has a deeply held commitment to inclusiveness grounded in respect for all, and we encourage our community to speak out when they feel that those ideals are challenged." Hough, who continues to be at the center of heavy backlash, further clarified his comments to HuffPost by sharing his take on some of his own experiences growing up and the conclusions he's drawn from them. Comparing the political and social struggles of two different races of people is not only distasteful, it ignores the different relationships Asians and African-Americans have with this country and society's varied perceptions of each group. But Hough is sticking to his guns. His only regret, according to The Guardian, is for drawing blanketing conclusions around "every Asian and nearly every black." Hough said his assessment of the difference between black and Asian students is based on his experience at Duke. "... the Asians -- even foreigners going back -- adopt very conventional first names as a sign of assimilation and are quite receptive to dating whites. The blacks in my class seldom have simple names. That is their right but sends a message,” he said. Hough is listed as a political science professor for the university and, despite earlier reports saying otherwise, was on academic leave when he posted the comments. Meanwhile, concerned parents have contacted Hough while one in particular has written to him to say she will not be sending her daughter to Duke because of him. In response, Hough wrote a letter to the parent that he later shared with HuffPost. He noted parts of this letter are specifically addressed to the parent and not what he "would emphasize to a more general audience." I do not teach on this subject, and 2016 will be my last year of teaching at Duke. Your daughter can avoid me next year. Unless things have changed the last year, her problem if she wants to date a white or Asian at Duke is the enormous pressure from the black mail [sic] population, who, I am told, do not want competition. I too see many black-white couples on the streets of DC and for a half century have thought intermarriage between whites and blacks was as crucial as for other ethnic groups. I have not seen such couples on the Duke campus. I have asked students why and get a generally uniform answer. I have been at Duke for 40 years and was a disciple of Martin Luther King in the 1950s. I am very disappointed in the lack of progress that I have seen. So I think would Dr. King. 60 years since Montgomery is a long time to say that the current black experience is the result of them not being voluntary immigrants when almost but Caribbeans have roots that go back before the Revolution. A very, very long time. Those blacks who come from the Caribbean were not in the Americas voluntarily. I remember the 1940s and 1950s. The Japanese concentration camps for American-Japanese showed the deepest of prejudice. One was not far from where I lived in the California desert. The Chinese were brought as contract labor. They too felt deep prejudice The Japanese who were imprisoned did not come out saying that they could not rise because of the prejudice and the scars of the camps. They and the Chinese rose. I do not think the reason was genetic. I think that lack of freedom of speech on this issue is one reason for the problem. Dr. King was talking for a melting pot America not a diverse one narrowly defined. I voted for Obama because of what he said about red America and black America. I hoped that he would say he was melting pot, half white and half black, and reach out to the red voters (the lower and middle income whites). He did not, and I am not surprised that polls say race relations are worse than for a long time. They are many ways to achieve acceptance. I think they should be debated. The Supreme Court has 6 Catholics, 3 Jews, and 0 Protestants. That is the opposite of diversity, given the enormous hostility of white Catholics, Jews, and Protestants towards each other in the past. Blacks should ask how that hostility dissipated so much that today we don't even notice the lack of diversity. Race in the early 20th century was defined by culture. Poles and Italians were called races, and there was a lot of mutual hostility between them. Poles were subject to the most humiliating of jokes about their stupidity. Go to the archives at the time Pope John Paul II was elected and read such jokes about him in the Duke Chronicle. Coach K was at Duke at that time. He didn't say that the jokes about Polish stupidity (or stereotypes about drunkenness) prevented him from rising. Instead he showed his incredible intelligence and discipline in the biggest of the big leagues, and he has been an historic force in destroying the prejudices against Poles in this country. His daughter married an Italian, and I remember when she gave birth to a son, Coach K told a press conference that the last thing he ever expected as a young man was a grandson named Giovanni. His experience provides lessons too. Blogs are places where there is some sloppiness and (in the NYT) about 300 word limits That editorial in the NYT was the worst that I think I have ever seen. There were typos in my outrage towards it and I could have been more careful (but hard in the space limits), as I have, I think, in this letter. But the Times is the voice of a party that is an unholy alliance of Westchester County and Harlem. That party gives Westchester a tripling of the market and Harlem (and everyone in the bottom 90%) a decline in wages over the last six years. The Times speaks for those in Westchester and other places such as Marin County who are its readers. It and its party gives Harlem nothing but symbolism and talk of racism of which I think that the editorial was a prime example. I think the worst problem for blacks is the Westchester wing of the party, not the white middle and lower income who vote red. I know there are blacks in the 20% of the population who own significant stocks, but for most of the black population I think the time has to focus more on the Asian experience and its lessons for them. That is a debate we need, and perhaps I should write a book that opens it up.